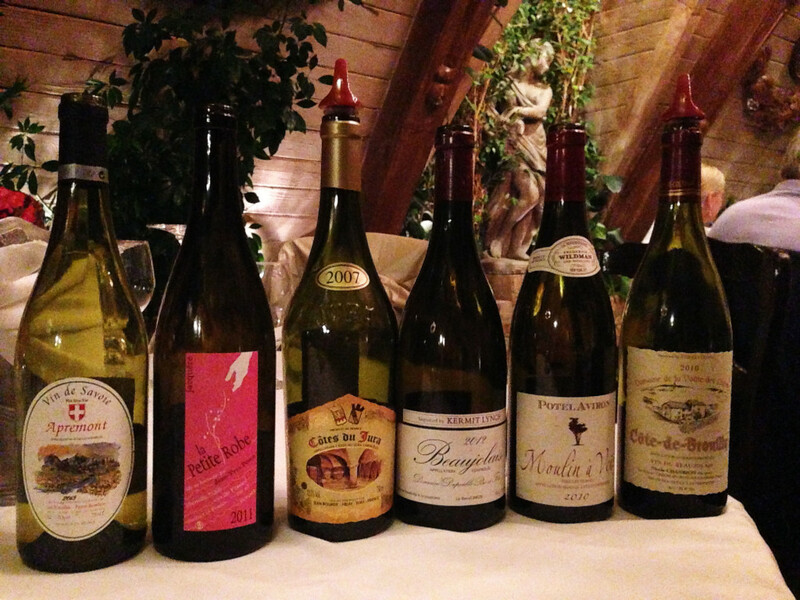 This week, we actually studied three regions in France: Savoie, Jura and Beaujolais. Beaujolais is a small wine growing region just to the south of Bourgogne. The land is only 34 miles long and 7-9 miles in width. The grapes of the Beaujolais region are few. 98% of the red grape plantings in Beaujolais are Gamay. The remaining 2% is Pinot Noir but that grape has been phased out as of this year. Just 500 acres of vineyards are dedicated to white grapes. Those include Chardonnay, Melon de Bourgogne, Pinot Gris an Aligoté. Aligoté is slated to be phased out by 2024 but can currently be blended into certain white or red wines. 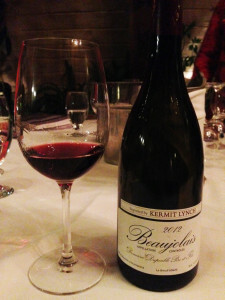 The Beaujolais that Americans are likely most familiar with is Beaujolais Nouveau, which is released the year of harvesting on the third Thursday of November. There is no aging period with Beaujolais Nouveau and any wines labeled as such must be hand-harvested and undergo semi-carbonic maceration. The region produces 50 million bottles each year on average which accounts for one-third of Beaujolais’ total production. Fortunately, the Beaujolais AOC and 10 Cru AOCs are also producing more complex wines that are aged in oak, concrete or stainless steel tanks. The “King of Beaujolais” is Moulin-a-Vent because it produces the most full-bodied and tannic wines of the Crus. There are 96 villages that can produce Beaujolais. Hand-harvesting of the vines is the norm in Beaujolais and Beaujolais Nouveau MUST be harvested by hand. The wines of Jura are rarely found outside of the Jura region itself. The majority of wines produced from this region are white and made up of either Chardonnay (43% of total vines) and Savagnin Blanc (22% of total vines). The three authorized red grapes also grown in Jura are Poulsard, Pinot Noir and Trousseau. Jura’s most famous citizen is Louis Pasteur, the French chemist and microbiologist who developed milk pasteurization as well as the anthrax and rabies vaccines. He also discovered and named “yeast” as the microbe responsible for alcoholic fermentation. The Jura is a major cheese-producing region and is best known for Comté, Emmental and Morbier. Savoie is an alpine region near the Swiss border. Very little wine is exported as skiers and other winter sports enthusiasts drink nearly everything that is produced around a pot of cheese fondue. There are 23 authorized grapes grown in Savoie. Jacquère represents 50% of the acreage however. Pinot Noir thrives in Savoie. There are three AOCs in the region. Pierre Boniface Apremont Les Rocailles Vin de Savoie 2013: Apremont is Pierre Boniface’s signature wine and accounts for 70% of his production and sales. 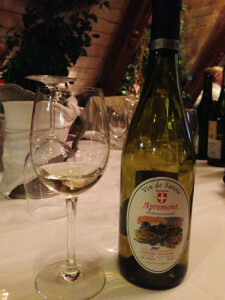 This Savoie wine is made from 100% Jacquère grapes that are sustainably grown. It is available for $14.99 in Utah and can be paired with fondue or simple fish, chicken or pasta dishes. Jean-Yves Péron La Petite Robes Vin de France 2011: This is a natural wine made from 100% Jacquère grapes—some of which come from 100+ year old vines on the steep slopes near Albertsville in the Savoie. It’s aged for a year in old oak and has a limestone, ciderish finish to it. 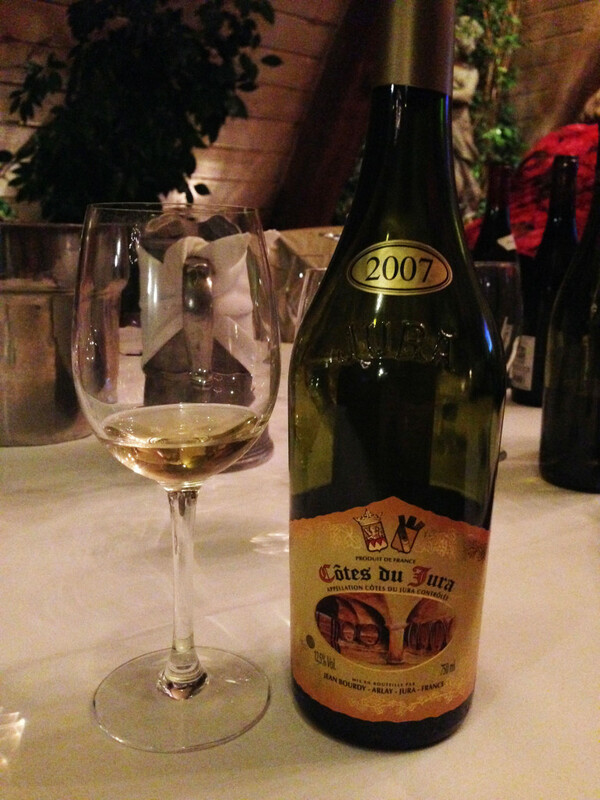 Jean Bourdy Côtes du Jara Blanc 2007: This wine is made by 15th generation direct descendants of the Domaine. The vineyards have been completely biodynamic since 2006 and this 100% Chardonnay is aged for 3-4 years in old oak barrels. It needs to be opened 3-4 hours before drinking. Despite its Chardonnay label, strong notes of lemon curd, steel and nuts are present. Pair with fondue and Comté and Morbier cheeses as well as fish and white meat. This wine can be kept for decades. 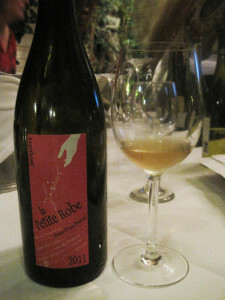 Domaine Dupeuble Pere et Fils Beaujolais 2012: This unfiltered Beaujolais wine is farmed using lutte raisonée. It’s aged in cement and stainless steel and tastes of blackberries, blueberries, raspberries, cinnamon, cherry, violets, petunias and graham crackers. Available in Utah for $16.99, it comes from vines that are 50-100 years old. The winery has been in continuous operation since 1512. 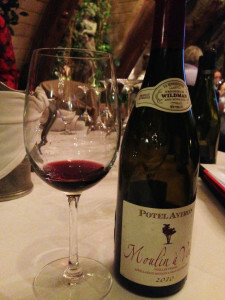 Potel-Aviron Moulin-a-Vent Cru Beaujolais “Vieilles Vignes” 2010: This wine is named after its two founders: Nicolas Potel and Stephane Aviron. Potel left the company in 2009 but the wine still bears his name. Pungent aromas of cherry and black raspberry are lifted by a hint of blood orange and dried violet. Utah DABC carries this wine for $22.75. Nicole Chanrion Domaine de la Voute des Crozes Côte-de-Brouilly 2010: Nicole Chanrion is referred to as “La Patronne de la Cote”. 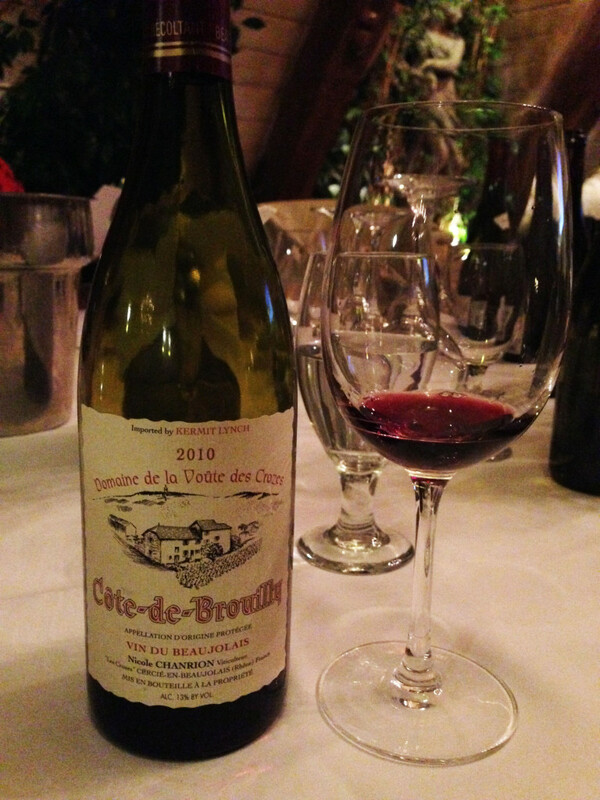 In 2000 she became President of the Côte-de-Brouilly appellation—a position of respect and importance. She works the vineyard by herself and farms using lutte raisonée. Rich and spicy on the palate, this wine brings forth aromas of strawberries and cinnamon and finishes with red and black berry notes. Pair with pike (fish), leeks and potatoes. It is available in Utah for $25.03.